Each month, we share a handful of beers that we think you should know a little more about, through the perspective of our collective palate. We tasted through the following 16 beers for June and rated them according to our very own interpretation of the BJCP scoring guidelines, on a scale of 100, listed in alphabetical order. We considered aroma, appearance, flavor, mouthfeel, overall impression and trueness to style. It's not an exact science–we know this. We just don't like to pass on the opportunity to drink more beer. This month we explore a handful of new Chicago offerings, a few collaborations, some coast-to-coast beers, and–for the first time in what seems like forever–no hazy pale ales. Whoa. Hot off its Gold medal in the World Beer Cup (for the Herb and Spice Beer category), 'Spruce' offers a welcome contrast to the typical IPA offerings of summer. It's a transparent yet rich golden color in the glass, with 'nostalgic' reminders of pine and citrus in the aroma. It presents a nice balance of grapefruit bitterness with biscuity caramel malts. A great (far) Northwest IPA. For Alters 100th brewed batch, the Chicagoland brewery celebrated by releasing this old school DIPA, showcasing New Zealand Motueka hops. While we were hoping for a more tropical, crisp finish to the higher-ABV pale ale, this one gave off a distinct lingering tinge of grapefruit bitterness. It's quite a bit maltier than one might've hoped for from New Zealand hops. Still, a decent malt-forward DIPA. Grisettes seem to be having a moment (think lower-ABV saisons with a drier, hoppier characteristic – a 'table beer' of sorts). Here, North Carolina's Brewery Bhavana puts their spin on the style, with Piglette, a dry and slightly tart, funky ale. It's been interesting to see a rise in drier beer styles as of late, while hazy juicy beers are having their time in the spotlight. Reach for this as a perfect intro for anyone curious of the style. I should start out by saying, we really really wanted to like this beer, especially given all the hits we've had from Blue Island as of late. A witbier brewed with lime and cucumber juice out of the brewery's "Soda Pop Series" seemed the perfect refreshment for a 90° Midwestern afternoon. Sadly, this one simply struck out. It was a bit of a 'miss' for the base style, the lime was hardly present and the cucumber gave off a too-vegetal finish, rather than crisp refreshing boost. Buckledown partnered up with Chicago-famous burger joint Kuma's for this one. We would have expected a beer with Kuma's name on it to be something boozy and in your face, but that isn't the case here. At just 5.3%, this pale ale has a huge grapefruit nose and an extremely dry taste from front to back. It leans slightly bitter, but nothing that would detract for slamming back a few of these while listening to metal and wolfing down an unnecessarily large burger at Kuma's. A peach IPA could have gone all wrong for Coronado, as this fruit sometimes tends to dry out the palate or taste like candied peach rings. We're happy to say that isn't the case here. The peach is present but subtle and is countered nicely by the Mosaic and Citra hop addition that leaves just the right amount of bitterness. A fruited IPA that would appeal to anyone this summer, whether they're averse to fruit in their beer or not. As far as refreshing pale ales go, those that highlight citrus like lemon, or melon very often take the cake. This one from Fonta Flora just about nails it. It's a pleasant balance of floral lemongrass and succulent honeydew melon and papaya. Still, there is some distinct malt sweetness on the back end, but it's still a refreshing APA fit for warmer months. If you are in the area of this one-off release, grab it. As with many of the non-Chicago brewed beers to come from Goose Island, we went in with fairly tempered expectations for Summer Hours. We were pleasantly surprised however, to find a real summer crusher here. This is a pretty basic hoppy lager with a prominent bready malt backbone and a slight bitter bite at the backend. It's not the most exciting beer, but we can appreciate a well made lager when we see one. Nitro tends to be polarizing and this reviewer tends to skew toward the "unnecessary" camp. Left Hand has certainly mastered the canned nitro beer however, and this is one of the better examples we've had from them. While the blackcurrant would likely be a lot more interesting in your average carb'd brew, the dulled flavor actually works here and makes for a fairly sessionable, refreshing fruit beer. If nitro and a little fruit sweetness are your thing, give this a try. In an era when the appearance of many craft beers would not get the 'my-dad-would-drink-this' approval, we can still appreciate a beautifully hued pinkish-pour of a beer. 'Mural' is just that beer. Spawned from a collaboration between New Belgium and Mexico City's Cervecería Primus, this fruit beer was inspired by the "ubiquitous fruit-based drink often found pouring out of jugs at street food stalls." It's a distinctly hibiscus meets prickly pear kinda beer; polarizing, but palate pushing no doubt. Rockford's Prairie Street has surprised us with some solid beers lately so we were excited to give their latest release a try. Feather Eye Rye starts with a heavy dose of rye aroma that follows through to the first taste. As you drink, you'll notice a considerably chewy, sticky character in the middle that mellows out significantly on the backend. This makes for an interesting and surprisingly drinkable rye IPA. Those who love all things rye will want to give this a look. Out of all the recent seasonals from the Boston brewery, this one caught our attention most–more than the summer ales and shandy-esque beers. The 'hoppy wheat' ale is one that we wish we saw more of. While it's unique to Sam Adam's 'Beers of Summer' variety pack, it's a nice break from the expected. It provides a welcome balance of refreshing German-esque wheat beers with a crisp bitter finish. If you want to try something new from the nationally prominent brewer, give this a shot. A beer that will appeal to many at this time of year, AgaveMente adds a twist of agave and hibiscus to a light bodied lager. The agave syrup, while the most dominant flavor, is subdued enough to not be overpowering, while the hibiscus adds a slightly tart finish. This is still a lager though which means the body and mouthfeel are light enough to enjoy a few without feeling full. This is different enough that it won't appeal to all but we'd pick it up for the beach. When Spiteful finally opened it's expanded North Side Chicago production space, a lot were excited to simply see more of their beers back on the shelves. And a lot of others were excited to see some new beers from the team. While lagers don't get every craft drinker excited, it's always great to see them done well from a small brewer. Here, the newly-canned release is a flavorful, fuller-bodied take on a classic German lager. It's a beautiful rich golden color with a sweet finish. Yes. Just as quickly as folks had finally heard that a brewery was moving into the former Metropolitan Brewing space in Ravenswood, the operation had a name and canned beers seemingly overnight. 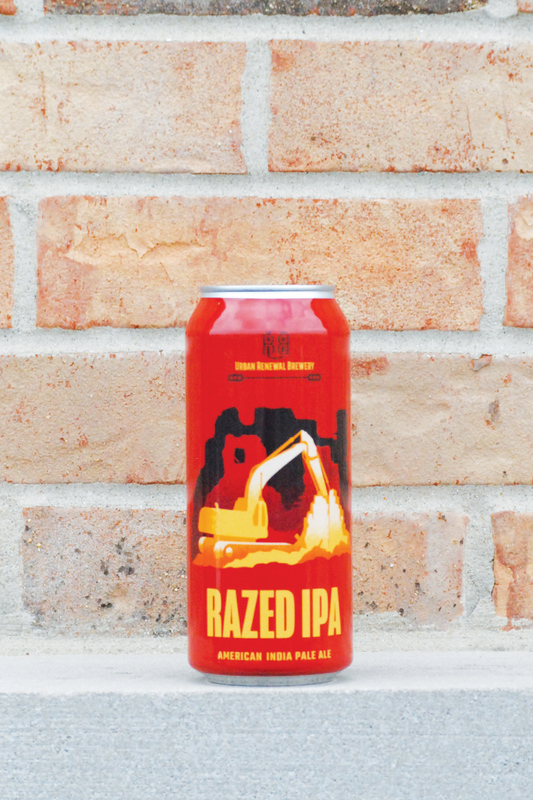 The first in a pair of releases is this Razed IPA. If we were to drink this blindly, it would have had us guessing rye IPA, with its hefty dose of caramel sweetness meets spicy grain. Couple that with–you guessed it–grapefruit citrus and you have what we would consider a return to the sort of 'Midwestern' style IPA–unmistakably balanced and malt-forward. Braupakt is the result of one of the more unique collaborations we've seen. Bavaria's Weihenstephaner and California's Sierra Nevada have somehow managed to combine the tastes of two wildly different brewing philosophies into something that actually makes sense. The beer pours like a traditional Hefeweizen with a big head and hazy golden color. You get a banana aroma which is continued through to first taste with an almost doughy mouthfeel. One of the more interesting beers we've had in a while and, while very familiar, somehow manages to be different. The Hop Review's monthly beer reviews are collected from beers gathered at the discretion of our team. They include beers collected from travels, local brewers, as well as shared samples.